Do you have interesting and important challenges involving snow and ice? We have a multi-chamber cold room that can go from < 0 ˚C to –20 ˚C, various techniques to quantify mechanical behaviour, and imaging equipment to characterise fine-scale structure. 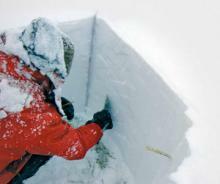 We have expertise in the fundamentals of ice and snow and how that understanding can be applied in practice.